Today, ARID Technologies, Inc., announced that ERG Petroli S.p.A has purchased and installed ARID's PERMEATOR Gasoline Vapor Containment System. 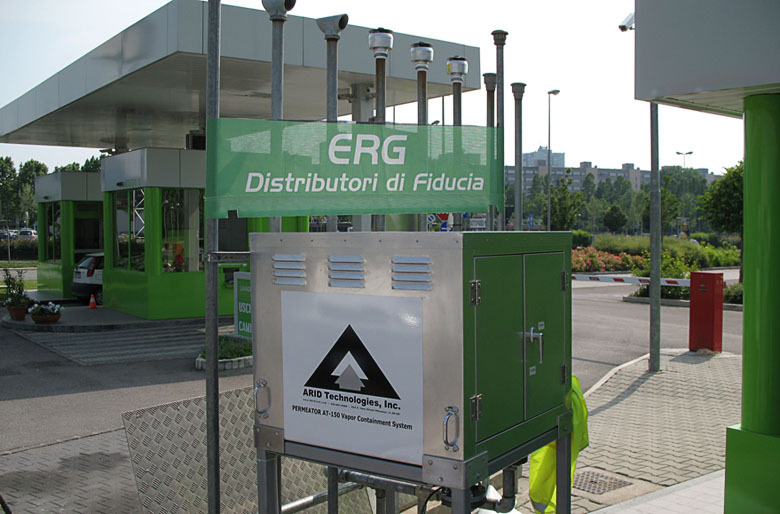 The installation took place at ERG's retail location, Green Gas Station, in Bologna, Italy. ERG is headquartered in Genoa, Italy, and joins a growing list of international petroleum retailers that have chosen the PERMEATOR for its economic and environmental benefits. The PERMEATOR conserves fuel, reduces emissions, and provides a safer and healthier refueling environment. ERG is Italy's leading independent energy and petroleum group. It strategically invests in the latest environmentally-friendly technologies, revitalizes industrial sites with the construction and proper management of new facilities, and implements the highest health and safety standards. By adopting the PERMEATOR technology, ERG has again demonstrated its commitment to customers and the environment. The PERMEATOR will reduce emissions from the underground storage tanks at ERG's fueling sites, contributing to the health and well-being of its customers/employees and preserving its petroleum investment. The PERMEATOR's patented hydrocarbon-selective membrane prevents the venting of gasoline vapors, known as Volatile Organic Compounds (VOCs), as well as the associated product loss from gasoline storage tanks. The system virtually eliminates evaporative emissions and has been proven since 1989, in large tank storage and refinery applications. A recent third-party study, conducted in Florida, concluded that evaporative losses can be as high as 0.35% of throughput (3.5 gallons per 1,000 gallons pumped). This same study calculated the PERMEATOR's recovery efficiency as 99.27%. ARID Technologies, Inc., is a recognized leader in membrane-based gasoline vapor recovery technology. Based in Wheaton, Illinois, ARID has over 360 of its PERMEATOR systems installed throughout Europe, Asia, and the United States. The domestic installations are implemented coast-to-coast, occurring in Arizona, California, Delaware, Florida, Georgia, Maryland, New Hampshire, New Jersey, Nevada, Ohio, Oregon, Pennsylvania, Texas, Virginia and Washington. Leading petroleum retailers, such as Costco, ERG, Giant Eagle, HEB, QuikTrip, Shell, Sunoco and Wawa, have come to rely on ARID for their vapor recovery needs. For more information about ARID, please visit www.ARIDtech.com.